This collection of essays brings together research on sense modalities in general and spatial perception in particular in a systematic and interdisciplinary way. It updates a long-standing philosophical fascination with this topic by incorporating theoretical and empirical research from cognitive science, neuroscience, and psychology. The book is divided thematically to cover a wide range of established and emerging issues. Part I covers notions of objectivity and subjectivity in spatial perception and thinking. Part II focuses on the canonical distal senses, such as vision and audition. Part III concerns the chemical senses, including olfaction and gustation. Part IV discusses bodily awareness, peripersonal space, and touch. Finally, the volume concludes with Part V on multimodality. 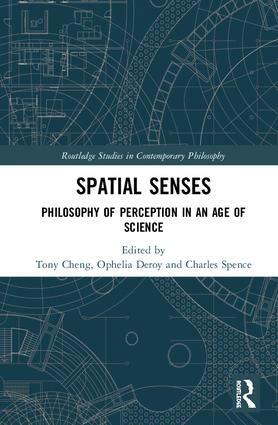 Spatial Senses is an important contribution to the scholarly literature on the philosophy of perception that takes into account important advances in the sciences. Part I: 21st Century Oxford Kantianism, or: Transcendental Philosophy Naturalised? 2. Is Bálint’s Syndrome a Counterexample of the Kantian Spatiality Thesis? 4. Wittgenstein, Spatial Phenomenology, and the "Private Language Argument"
Tony Cheng is a Ph.D. Candidate at University College London, UK. His works have been published in Phenomenology and Cognitive Sciences, Philosophical Investigations, Philosophical Psychology, and Trends in Cognitive Sciences. Ophelia Deroy holds the Chair in Philosophy of Mind at Ludwig-Maximilians University, Germany, and is also the Deputy Director of the Institute of Philosophy at the University of London, UK. Her work has appeared in Multisensory Research, Philosophical Studies, and the Oxford Handbook of Philosophy of Perception, and she is the editor of Sensory blending: on synaesthesia and related phenomena. Charles Spence is Professor of Experimental Psychology and Head of the Crossmodal Research Laboratory at the University of Oxford, UK. He is the co-author of In touch with the future: The sense of touch from cognitive neuroscience to virtual reality (2014), and also the author of various other books. He has hundreds of papers in high-profile journals.